Lepista nuda, the Wood Blewit, grows in leaf litter in deciduous and mixed woodland and under hedgerows during autumn and winter, often fruiting well into December during mild weather. Wood Blewits are bluish... at least when they are young. The caps, gills and stems are actually more of a violet colour, but the cap surface soon loses its blue or violet coloration and turns ochre or tan from the centre; however, the gills and stem invariably retain some of their their violaceous colouring even when fully mature. 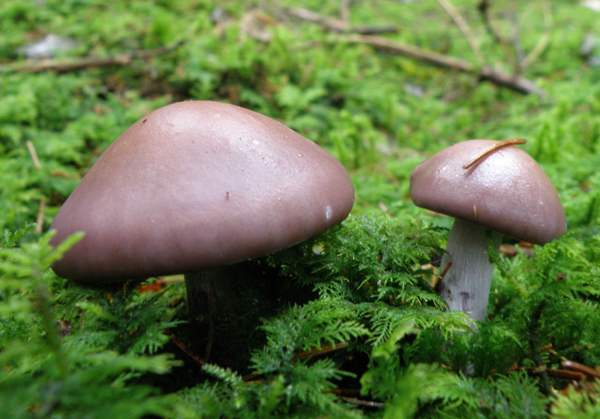 Perhaps surprisingly, Wood Blewits can be used to dye fabrics or paper a grass green colour rather than lilak, purple or blue. To make a green dye the fungi are chopped up and then boiled in water in an iron cooking pot. 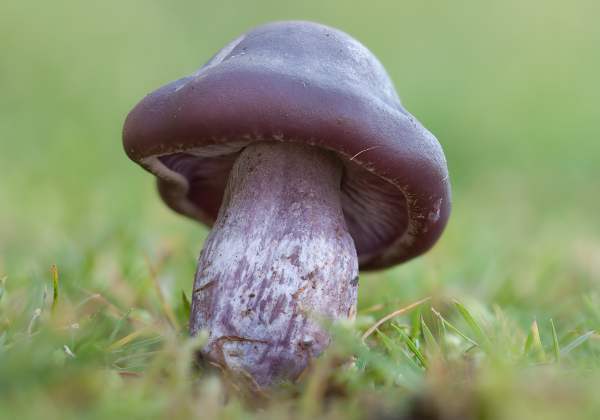 Common and widespread across Britain and Ireland, the Wood Blewit Lepista nuda is found throughout mainland Europe and in many other parts of the world including North America. Originally described in 1790 and named Agaricus nudus by the French mycolgist Jean Baptiste Francois Pierre Bulliard, in 1871 the Wood Blewit was transferred by German mycologist Paul Kummer into the genus Tricholoma. Mordecai Cubitt Cooke moved this species it to the genus Lepista also in 1871, and so Tricholoma nuda and Lepista nuda are synonyms. 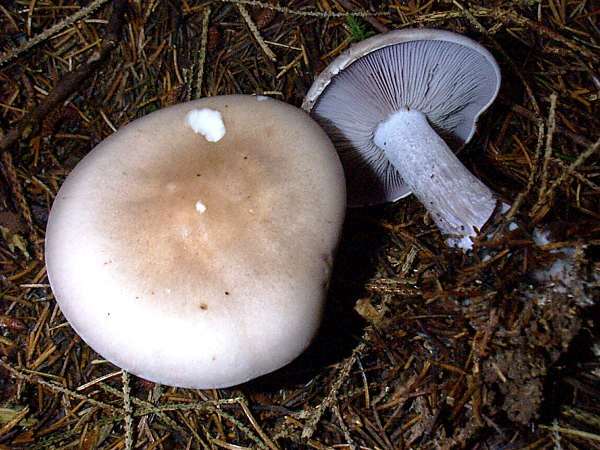 The name Clitocybe nuda, proposed by Howard E. Bigelow & Alexander H. Smith in 1969, is preferred by some authorities and particularly so in the USA, but at the time of writing (2012) the Kew Gardens and BMS checklists retain Lepista as the genus. 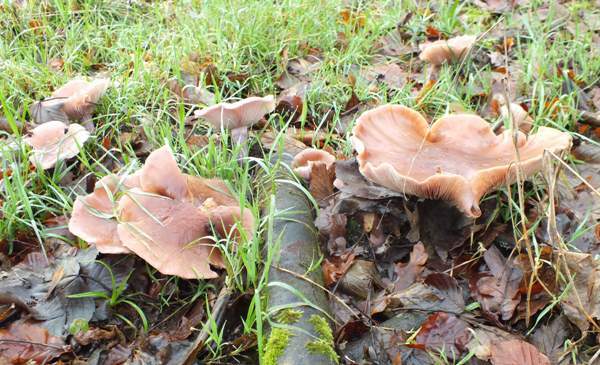 Over the past couple of centuries and more Lepista nuda has gathered a plethora of synonyms including Tricholoma lilaceum (Quél. 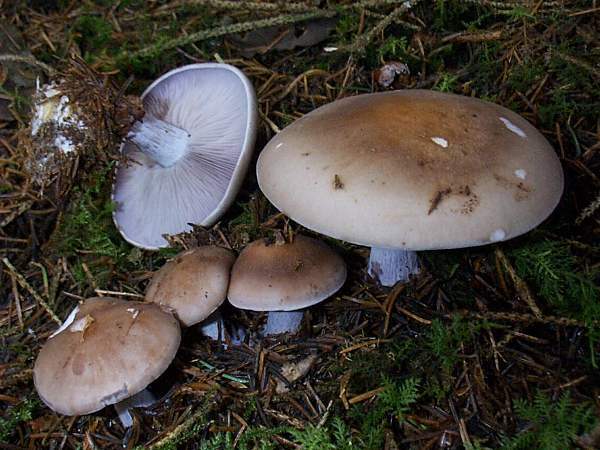 ),Agaricus nudus Bull., Agaricus bulbosus Bolton, Agaricus bicolor Pers., Cortinarius bicolor (Pers.) Gray, Cortinarius nudus (Bull.) Gray, Tricholoma nudum (Bull.) P. Kumm., Agaricus nudus var. majus Cooke, Tricholoma nudum var. 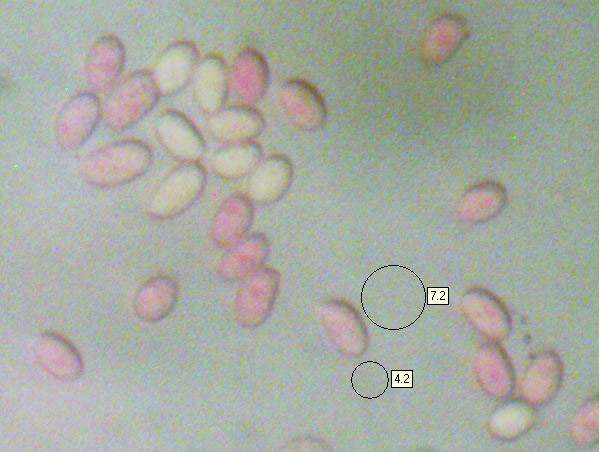 majus (Cooke) Massee, Rhodopaxillus nudus var. pruinosus Bon, Lepista nuda var. pruinosa (Bon) Bon, and Lepista nuda f. gracilis Noordel. & Kuyper. 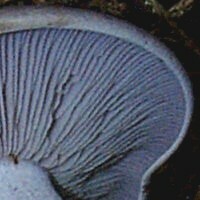 Lepista is derived from Latin and means a wine pitcher or a goblet, and when fully mature the caps of Lepista species do indeed become concave (sometimes referred to as being infundibuliform) like shallow chalices or goblets. Rather as it sounds, the specific epithet nuda simply means bare or naked. Care is needed to ensure that these edible mushrooms are not confused with some of the larger purple species of Cortinarius fungi. Cortinarius fungi all have rusty brown spores, so it is fairly easy to distinguish them from Lepista nuda by making a spore print. 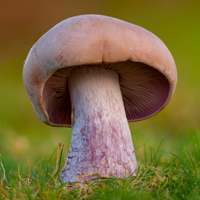 The violet-tinged cap and gills of the young wood blewit, together with its stocky build, distinguish it from other purple or lilac coloured fungi. 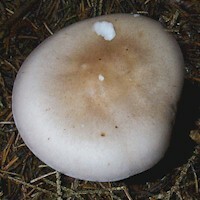 Often growing in fairy rings in mixed woodland, the caps mature at 6 to 15cm in diameter and retain a slightly inrolled margin until the violet tinge fades and the surface turn buff with mid brown centres. 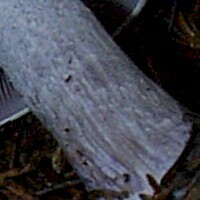 Old specimens sometimes develop wavy margins. Sinuate and crowded, the gills have a beautiful lilac flush when young, turning buff and then brown as the fruiting body matures. 15 to 25mm in diameter and 5 to 10cm tall, the non-tapering stipe is solid and often has a swollen (clavate) base. 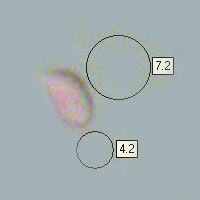 Ellipsoidal, 6-8 by 4-5µm; ornamented with tiny spines. Faint aniseed odour and a pleasant taste. Saprobic, on leaf litter in mixed woodland, the Wood Blewit is also found occasionally under hedgerows and even on garden compost heaps. These attractive mushrooms can also appear in dune slacks containing dwarf willow and other low-growing shrubs. Most plentiful in Britain and Ireland from August to December, but occasional fruitbodies can emerge at any time of the year. Lepista saeva, the Field Blewit, is a less common species; it is very similar but lacks the violet tinge to the cap. Long after Field Mushrooms, Chanterelles and most other popular edible fungi have all disappeared, Wood Blewits are still plentiful. They are edible if well cooked, but it is a wise precaution to try a very small portion at first because they have been known to disagree with some people. 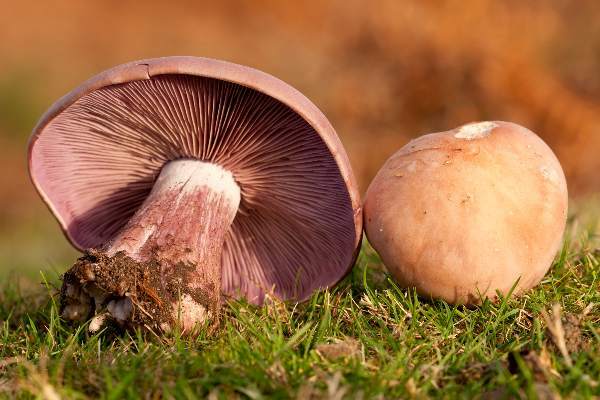 In many parts of mainland Europe Wood Blewits are available in supermarkets throughout most of the autumn and winter months, and they are particularly popular in France, Spain and Portugal. Young caps are best, and they have the added advantage of retaining their bluish colouring as an aid to identification. Assess all identification characters: never use cap colour alone to identify mushrooms: some of the most poisonous fungi have a blue or violet tinge! Above: After the first frost of winter, mature Wood Blewits can look very different from those found in summer and autumn. Pat O'Reilly, Fascinated by Fungi, 2016.